Although many cultures consider black a morbid and depressing color, black also has its good points when used right! Symbolizing sophistication, maturity, mystery, strength and power, black is a truly timeless and classic color of elegance that has landed a spot in our Color Chronicles series. Even though black may mean the absence of color, this beautifully dark color can be meshed with many other colors as well, from gold to white. With our special color edition Color Chronicle, we’ve handpicked edgy, elegant and simply fabulous black-colored, handmade goodies that were made by indie sellers from Etsy. From accessories to home decor, our 15 Shades of Black are sure to bring the positive aspects of black into your days! Add that subtle feminine touch to your boots with J. Lee Jewels’ floral boot cuffs! This pair of boot cuffs feature lace fabric that has floral designs, which gives these boot cuffs a mix of edgy and chic style. Made from stretchy material, you can be sure you’ll get a comfortable fit with these boot cuffs. Sizes from XS to XL are available for this pair of boot cuffs. Need that little black dress in your wardrobe? Then marcellamoda’s black cocktail sheath dress is a closet must-have! Made from Italian jersey fabric, this slim-fitting, soft dress is comfortable and has a mod, chic style. With a low, scoop neckline, this dress allows you to accessorize with big, bold and edgy accessories. 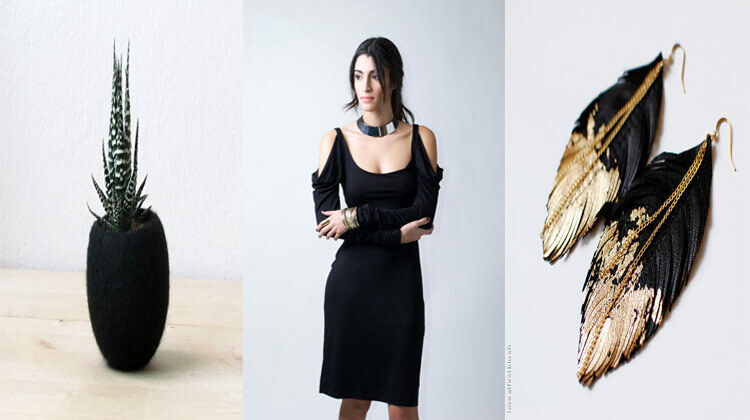 Discover more ultra stylish dresses here in marcellamoda’s shop! 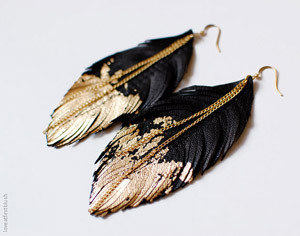 Brighten up your attire with gold-dipped, leather feather earrings! In a deep, dark black color, these leather feather earrings shine beautifully with the ends dipped in glimmering gold coloring. Gold chains are attached to the earrings for extra movement and flair. Even as dangle earrings, this pair won’t weigh you down, thanks to its super light weight! Dress up your outfits in an edgy, quirky way with Carousel Ink’s hot air balloon print leggings! These black leggings present hand-drawn images of hot air balloons and other scenery elements in misty grey for a whimsical, mysterious appearance. Made with 95% cotton and 5% spandex, you’ll be getting a long-lasting, comfortable and flexible pair of unique leggings from Carousel Ink! Check out more of Carousel Ink’s black leggings, which feature more fun designs. 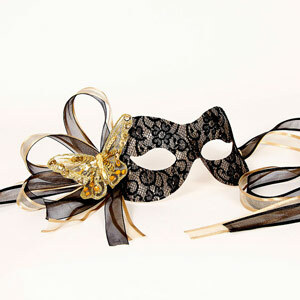 Enter any masquerade in style and elegance with Samantha Peach’s black and gold mask! Covered with black, lacy, floral fabric and embellished with extravagant organza ribbons, this mask is a great pair with black, red or gold dresses. With ribbons to help you tie and secure this mask on your face, you get lots of flexibility to adjust this mask in order to get that perfect fit. by Mercy Grey Designs Co.
Go to school or work in style with Mercy Grey Designs Co.’s Aztec design hobo bag! 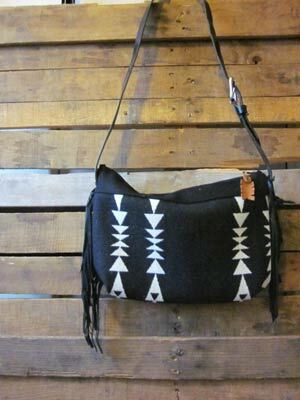 Featuring trendy, tribal arrow designs, this hobo bag is made with black wool fabric on the exterior side and lined with cream-colored fabric on the interior lining. With a re-purposed leather strap, this hobo bag is stylish and eco-friendly all in one. Three interior pockets are added to give you a better way to organize your belongings. 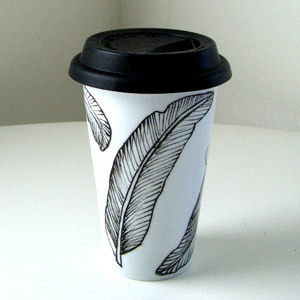 Travel in whimsical style with Sewzinski’s feather ceramic travel mug! Painted with non-toxic materials and heat set to make the detailed feather design long lasting, this reusable travel mug is eco-friendly as well as efficient since you won’t be needing paper-made mugs anymore! The lid is made of black silicone so that it’s easy to clean and use over and over again. This mug fits 11-ounce of your favorite beverage so that you can enjoy it on the way to work every morning. 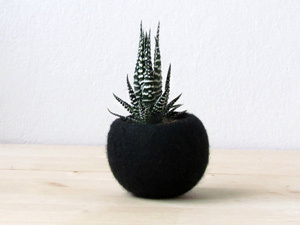 Give your flowers or other greenery a new home with The Yarn Kitchen’s black felt air plant pod! Wrapped in lovely, black wool yarn, this plant pod can fit small plants, such as succulents and air plants, and become a wonderful addition to your home or porch decor. As a clean, chic and minimalist item, this plant pod also makes a great gift for nature-loving friends. 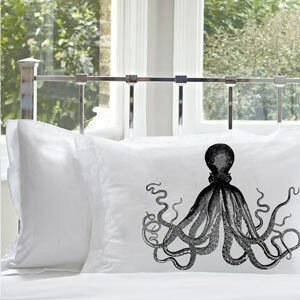 Get one of the most elusive sea critters to sit on your couch with Royal Kane’s octopus print pillow cover! Whether for a unexpected, whimsical living room decoration or for a nautical-themed bedroom, this pillow cover can be used with many types of home decor. The Ancient Octopus design has been screen printed on a pure white pillow cover that measures 20.5×31 inches. Burn incense everyday with A Contre Sens’ mystical, wooden incense holder! 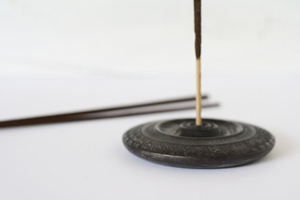 Made from a plane tree that was planted near a castle, this incense holder is textured with a decorative pattern that gives the incense holder more depth. The holder is stained with black and polished to give it a shiny appearance. This incense holder has only one hole for one incense at a time. 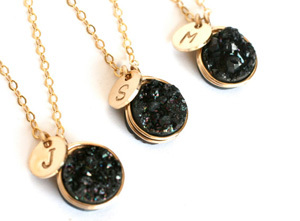 If you’re going with a classic and sophisticated black and gold theme for your wedding, then present your bridesmaids with Wrenn Jewelry Weddings’ black druzy necklaces! Each necklace has a round, black druzy pendant and has a gold, personalized charm to make each necklace extra special for each bridesmaid. If you’re looking for a more subtle look, you can also get these necklaces in sterling silver. Top your gourmet cakes or cupcakes with Cupcakes By Christy’s black royal icing flowers! 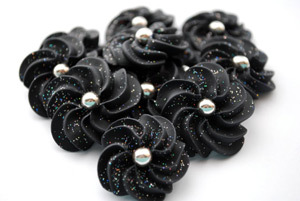 These fanciful flowers come in a black color, are centered with a large, silver dragee and are dusted with silver glitter to give these flowers that extra elegant sparkle. This listing includes 24 royal icing flowers and makes all your cupcakes or cake look professionally decorated. Perfect for sophisticated dinner parties or a Sweet 16, these black royal icing flowers are a great addition to any event. Show your love for your partner with Mika Art’s small penguin illustration! 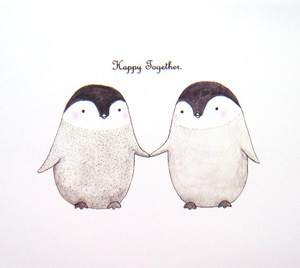 This print features two adorable, fluffy penguins holding hands lovingly and has “Happy Together” printed above the penguins. Coming in a 4×6 size, this print can be part of an anniversary card to your lucky lady or gentleman. You can also get this print in 5×7 size here in Mika Art’s shop. 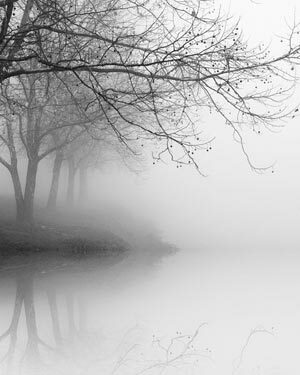 Haunting, mysterious and stunning, Nicholas Bell Photography’s foggy, black and white tree photograph is a fantastic way to depict some of the meanings of the color black. With almost naked tree branches looming over the water, this photograph of nature is a great present for friends and family members who adore the outdoors. Titled “Winter Tree Reflections,” this photograph is a one-of-a-kind original by Nicholas Bell Photography, so grab one for yourself while they’re still available! Want unique rings for your wedding bands? Check out Rosler’s mod-styled, black carbon fiber and graphite ring set! The lady’s ring is made into a slimmer version and has a small yet noticeable Swarovski crystal. 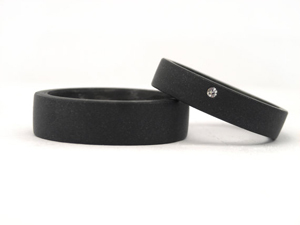 The gentleman’s band is thicker, making it perfect for a manly wedding ring. With the sturdy, topnotch materials used to make these rings, you can be sure these rings won’t wear and tear down easily in any type of element, such as seawater. All sizes are available for this ring set, and you can also purchase this style of ring separately. Check out Rosler’s main shop for more uniquely handcrafted rings! Be sure to come back for our last but equally fabulous chapter of our Color Chronicles series, white, the color of pure radiance!